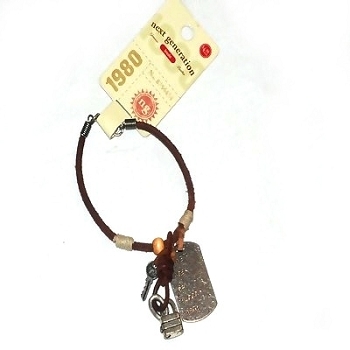 Home > Head Shop / Exotic > Leather Bracelet with Dogtag, lock and key and hemp spacers. leather band bracelets with a with a dogtag, a lock and key with 2 strands of hemp (the lock is nonfunctioning. All bracelets include the Next Generation seller tag with bar code and retail price of $4.99. The bracelet is just under 8 inches. All measurement are approximate.